Quinn Latimer, Editor-in-Chief of documenta 14 Publications, speaks about the South as a learning process, documenta’s public programme taking place in Athens and language as a liberating act. Ms. Latimer, what do you mean by “South as a State of Mind” in documenta’s magazine? Is documenta 14 just centered on the North-South divide or is it going to address South-South relations as well? 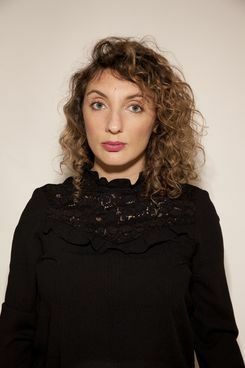 South as a State of Mind was founded by Marina Fokidis in Athens in 2012. Beginning in 2015, it temporarily became the documenta 14 journal, edited by myself and documenta 14 Artistic Director Adam Szymczyk. We have published three issues so far; we have one more to go. I’m sure the meaning of the title for Marina is a bit different, but I have always read it in a number of ways. One may understand it as a nod to a geopolitical site in contemporary narrations of power and what are commonly referred to as the “Global South” and the “Global North”, once called the “East” and the “West”. But it also may be read as a space for imagination, resistance and a certain kind of climate-induced subjectivity, be it radical or not. Despite exploring aspects of the entangled history of modern Greece and Germany, however, documenta 14 is not interested in embodying or furthering binaries like the North-South divide, and neither is our magazine. 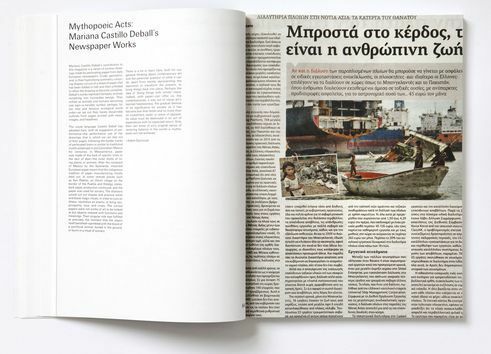 MARIANA CASTILLO DEBALL | “NEWSPAPER WORKS” In: SOUTH AS A STATE OF MIND #7 [DOCUMENTA 14 #2] 2016, S. 64-65 | Courtesy Mariana Castillo Deball For the first issue of the D14 South we decided to look at forms and figures of displacement and dispossession, and the modes of resistance found within them. For me, the crucial essay is the one by feminist political theorist Françoise Vergès. It’s a text I still think about. In it, she describes growing up amid the resistance movements on La Reunion Island, a former French colony in the Indian Ocean, and then later on in Algeria. Vergès narrates the long history of South-South relations, something often left out in hegemonic histories of center and periphery. She describes a world of exchanges between Africa and Asia – a world, as she writes, “of solidarity routes among anti-imperialist movements of the various Souths, the Southern world of music, literature, and images.” For her, Europe was geographically and culturally on the periphery. Her essay Like a Riot: The Politics of Forgetfulness, Relearning the South, and the Island of Dr. Moreau invokes Audre Lorde’s famous maxim: “The learning process is something you can incite, literally incite, like a riot.” Inspired by Françoise’s essay, we have tried, to the degree that we can, to displace the centrality of “Europe” in our thinking and in the work that we do. We did not come to Athens three years ago to make a magazine about the “South” per se and yet by being here the work changes, one’s thinking changes. Greece is the starting point in this edition of documenta. The programme connects Greek’s military dictatorship with other dictatorships worldwide (among them Chile, Argentina and Spain). Is it a counterpoint to the fact that Athens is the birthplace of democracy? What are the reasons to speak about it? The public programmes of documenta 14, called The Parliament of Bodies and ongoing in Athens since September 2016, has focused at times on the history of the Greek dictatorship – it’s true. It’s an episode that happened not so long ago (1967 to 1974) and, as with many violent periods of fascist rule across the world, it’s a history that has often been systematically suppressed by successive governments, democratic or other. 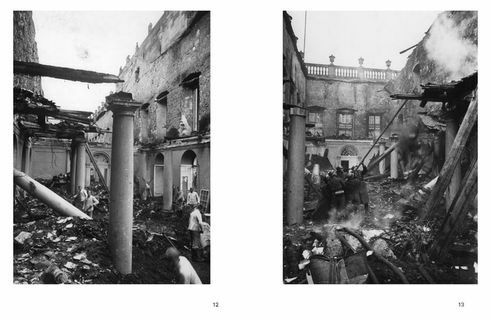 The Fridericianum in Kassel after the Allied air raids of September 8 and 9, 1941, South as a State of Mind #6 [documenta 14 #1] (2015), pp. 12–13. | Courtesy South as a State of Mind The Parliament of Bodies is held in a building in Parko Eleftherias (Freedom Park), a former nineteenth-century military quarter. Behind the Athens Municipality Art Center, which hosts documenta 14’s public programme, is the Museum of Anti-dictatorial and Democractic Resistance. Both buildings were used by the dictatorship: one as offices, one as a site for torture. The Greek Ministry of Defense still owns the buildings: both the art gallery and the museum of memory, which seems like a pretty emblematic state of institutional progression in our contemporary world. After former sites of governmental violence become cultural centers and contemporary art galleries, after former factories become our museums, what does the institution become next? This is all to say that ideas and forms of democracy and freedom have always been tied to their denial. That Athens is said to the “birthplace” or sometimes “cradle” of democracy makes it sound very natural, almost biological. There is nothing natural about it, though. We’re seeing this more clearly now, perhaps, as democracy itself – in all its undemocratic forms – seems to be shedding its skin across the West, which took so much of its democratic political imaginary and visions of white male supremacy from its elected ancestors in ancient Greece. These are all reasons to speak about it, I suppose, not in order to simply memorialise or institutionalise the past, but to think and voice how such authoritarianism continues to be enacted today. Parallel to documenta 14, the city of Athens is also presenting the Athens Biennale 2015-2017, “Omonoia” (Concordance/Agreement). One of its programmes, the Synapse sections “Rethinking Institutional Critique – A view From the South”, is also addressing the topic of the “South”. Is this event linked to documenta 14? If yes, in which sense are both art events related? I think language floats – terms migrate. And sometimes they hit the ground. Thinking through the ideas and implications of the “Global South” has been an academic and political focus for years now, which I am sure the Athens Biennale is also picking up. That Athens has had a magazine for several years called South is very likely another reference. That said, the Athens Biennale programme is not linked in any sort of collaborative way to our own. Nevertheless, the biennale’s offices are just upstairs from ours. We are breathing the same air, so to speak. Naeem Mohaiemen, “Volume Eleven (A Flaw in the Algorithm of Cosmopolitanism)”, South as a State of Mind #6 [documenta 14 #1] (2015), S. 150–151. | Courtesy South as a State of Mind Another important issue of documenta 14 is language. 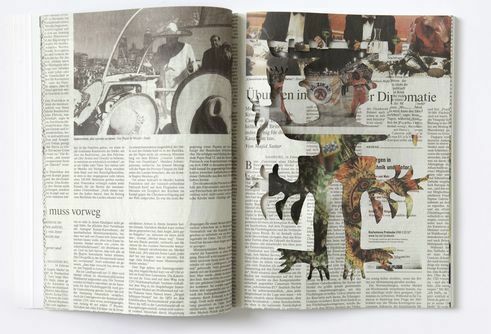 How does the magazine understand it and what does it add to documenta’s programme? Language structures our reading of and our being in the world. Language is also a form of control. But language, untied from its empty clichés and fascist operations, can be liberating as well. It is the medium in which we think; it is often the medium in which we relate to others. I’ve been thinking about the foundational act of language – its uses and abuses and affects, as public rhetoric or private literary production. Thus the d14 publications explore language itself; they do not simply employ it in the service of various aesthetic, political, and discursive regimes. One way we’ve considered the publications of documenta 14 is as a means of reading power through resistance to it. The magazine is also a space in which the artists of documenta 14 can test out ideas, try to articulate or generate something new. Some artists have created works for the magazine that think through those they are creating for the documenta 14 exhibitions in Athens and Kassel. Likewise, documenta 14 is not primarily an exhibition with sideshows of publications and public programmes. The magazine South as a State of Mind, the public programme The Parliament of Bodies, the exhibitions in Athens and Kassel, together they make up what we know as documenta 14. 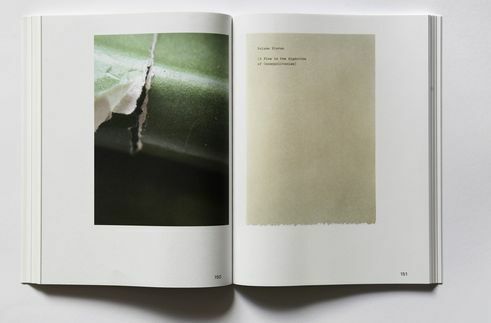 Sarah Lucas: Describe This Distance (Mousse Publishing, 2013), and Rumored Animals (Dream Horse Press, 2012). A regular contributor to Artforum and a contributing editor to Frieze, she is also the editor of Paul Sietsema: Interviews on Films and Works (2012), and co-editor of Stories, Myths, Ironies, and Other Songs: Conceived, Directed, Edited, and Produced by M. Auder (Sternberg Press, 2014) and No Core: Pamela Rosenkranz (JRP-Ringier, 2012). She is Editor-in-Chief of Publications for documenta 14. Katerina Valdivia Bruch conducted the interview. She is a Berlin-based freelance curator, writer and art critic. Copyright: Text: Goethe-Institut, Katerina Valdivia Bruch. This work is licensed under a Creative Commons Attribution – Share Alike 3.0 Germany license.